Central Bank governor Philip Lane said the measures protect borrowers from excessive debt. THE CENTRAL BANK has been criticised today for its decision not to make any changes to mortgage measures as experts warn it will delay the ability of renters to buy their own homes. 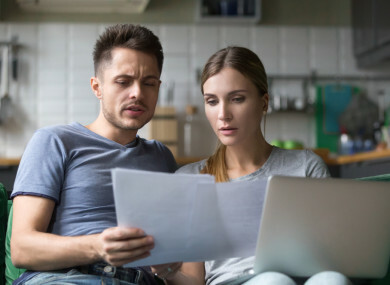 The regulator completed a review of mortgage lending measures and said the current system is “achieving the objectives of maintaining financial stability and protecting consumers”. The review found that new mortgage lending does not appear to be the most prominent driving factor for house prices and an increase in supply should help moderate the increases. “While the level of house prices and rents, particularly in urban areas, pose serious affordability concerns, a sustained and substantial expansion in housing supply is the fundamental solution: a fully functioning and sustainable housing market is not achieved by tolerating imprudent lending standards by banks or excessive borrowing by households,” he said. He said these measures are important in ensuring a more resilient financial system that will be better placed to absorb the impact of future downturns. Rachel McGovern, director of financial services at Brokers Ireland said this will “force people into the rental market where there is a yawning gap between repaying a mortgage on a home and paying rent on a similar home”. These rules by their very severity are most certainly contributing to there being a lost generation stymied in their efforts to begin their financial planning journey with the purchase of a first home, laying solid foundations with the discipline of mortgage repayments and building security for later years. Joey Sheahan, head of credit at MyMortgages.ie said the case deposit required for a €300,000 property is “simply too high for city dwellers who are struggling with high rents”. He said city-based first time buyers should be able to avail of the 90% rule regardless of the purchase price. He also said homeowners who have outgrown their starter home or who are in negative equity should not be required to avail of an 80% loan as there is an assumption they have equity from their existing house, but this has not been the case for many people. “Those without sufficient equity to relapse a deposit from their existing home, should also be able to avail of a 90% loan,” He said. Email “Warning people will be stuck in rental market as regulator leaves mortgage rules unchanged ”. Feedback on “Warning people will be stuck in rental market as regulator leaves mortgage rules unchanged ”.